Little Common Football Club will make its Emirates FA Cup debut against the team it will groundshare with next season. Today’s (Friday’s) draw for the world famous competition handed Common a home tie against Eastbourne United AFC in the extra preliminary round on Saturday August 5. Common will play their home games at Eastbourne United’s ground, The Oval, during the 2017/18 campaign as their own home at Little Common Rec doesn’t meet the grading requirements for step six of the non-league pyramid. 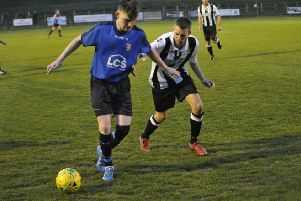 The Commoners finished runners-up in Macron Store Southern Combination Football League Division One last term with a century of league goals, while Eastbourne came seventh in the Premier Division. The winners of the match will receive £1,500 and will be away to Chatham Town or Littlehampton Town in the preliminary round a fortnight later. Common are one of 18 clubs from around the country who will be making their FA Cup debut next month. A total of 737 clubs have entered this season’s cup, with 370 of those starting their campaign on August 5 when 185 extra preliminary round ties will be played across the country. Common will be away to Combined Counties League Premier Division outfit Walton & Hersham, meanwhile, in first round qualifying for the Buildbase FA Vase on Saturday September 9. The winners will earn £550 and a trip to Sporting Club Thamesmead in second round qualifying two weeks later. Common’s neighbours Bexhill United have a bye through to second round qualifying, in which they will be away to Gravesham Borough or Cobham.